It’s the Second Day of Christmas so it seemed a good idea to post a double review today for Bon Courage! : A French Renovation in Rural Limousin and Bonne Chance! 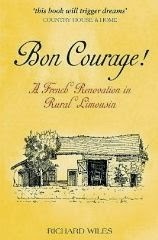 : Building a Life in Rural France by Richard Wiles, his memoirs of renovating and settling into rural Limousin life. Richard and his wife Al want to put down some roots in France and fall in love with a large barn in the Limousin that comes with enough land to fulfil Richard’s dream of owning llamas, as well as plenty of renovation work to keep them busy, once they have evicted the rats. This is a gently paced, enjoyable memoir written in a friendly style with a great mix of renovation tales from the good and the bad, to the tricky and the leaky. Richard has been writing about home renovations and DIY projects for many years and is also the author of Dictionary of French Building Terms: Essential for Renovators, Builders and Home-Owners so he was quite detailed when describing the work they were carrying out. This makes the memoir useful and informative as well as entertaining. As they settle into their rural French renovation, family issues in the UK slightly shadow the excitement, but their relationship came across as strong, fun and able to withstand the pressures of working, renovating and living apart for long periods of time. We learn alongside them about some of the local fêtes and traditions and we meet the characters who welcome them, hear about the disputes in the hamlet and the generosity they find, including the odd shaped vegetables that appear at their front door. This is the first of two books and sets the scene nicely with just enough tasters as to where they wanted their French life to go. It left me ready to read more, so I jumped straight into Bon Chance! With the rats gone, the neighbours cows evicted and the barn looking and feeling more like home Richard and Al are settling into life in France together and enjoying sharing their new entertaining space. The time is right to add the new members to their family which gives him the opportunity to entertain us with his tales on llama farming. 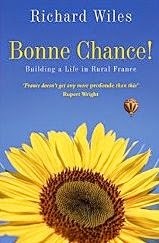 Life in France ticks over despite the worst the weather, French bureaucracy and life in general can throw their way and Richard is able to write a very funny account of rural French life even when things don’t quite go to plan. Through his love of hot air ballooning and marathon running, that earn him bemused looks from his French neighbours, we get to share in life outside (and above) the hamlet too. As well as his descriptions of the nature he loves, I especially enjoyed his chapter on the city of Limoges. I just wish I had read it before the rather damp morning I spent there this year where I now realise I missed most of the best bits. I felt a little bereft at the end, as I’d finished two great memoirs, I'd enjoyed his writing style and I’d love to read more from Richard.